Astrophotographer Miguel Claro took this image between the Giant’s Causeway, near Bushmills, in northeast coast of Northen Ireland on March 20, 2015. 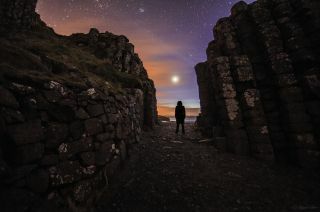 A stargazer enjoys a dazzling view of the planet Venus in this spectacular photo taken above the Giant's Causeway in Northern Ireland. Astrophotographer Miguel Claro took this image between the Giant's Causeway, near Bushmills, in northeast coast of Northen Ireland on March 20. Near the top edge of the image we can also see the Pleiades star cluster. Comprising 800 stars, the Pleiades star cluster (M45) was formed about 100 million years ago and is located 410 light-years from Earth in the constellation Taurus. One light-year is the distance light travels in a single year, which is about 6 trillion miles (10 trillion kilometers). Giant's Causeway is an area of about 40,000 interlocking basalt columns, the result of an ancient volcanic eruption.